Robin McKinley knows first lines. You read just the first sentence and immediately feel like you've entered a world entirely complete and utterly its own. And you want to sit down and stay awhile. Chalice is no exception to the rule. 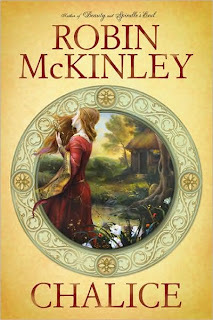 The world reminded me a bit of the kingdom in Spindle's End, both of them deeply entrenched in a sticky sort of magic with a heritage and weight to it. The characters reminded me a bit of those in Rose Daughter, purposefully a bit vague and left up to your imagination to carve out clearly. All of them living their lives as best they can with a sure but undefinable sense of doom hanging over their heads. Mirasol occupies a position known simply as Chalice. She is the second-highest ranking individual in the Willowlands and it is her job to bind relationships and ties within her domain, between the people and the land they both live on and belong to. At the opening of the story, a new Master (the highest-ranking individual in the land) is coming home to take control of the Willowlands and try to restore some order and peace after the debaucheries and mistakes of his older brother, the previous Master. Mirasol and the new Master have their work cut out for them as she is brand new to the position with no idea how to do what she must, and he is a third-level priest of Fire who is no longer quite human and must tread with extreme care so as not to burn everything (and everyone) he touches to ash. Sigh. Chalice is a bit of the loveliness, to be sure. It is short and as sweet as the honey that pervades the story's every pore. In fact, just as Sunshine left me with a killer craving for cinnamon rolls, Chalice made me wish I was five years old again and sitting in the kitchen with my Grandpa sucking fresh honey straight off the comb. There are only a few characters in this story and so it seemed that much more important that the ones I had make it through their challenges well and whole. I liked how they seemed to gain additional form and substance as they grew closer and closer to the final test. Until, at the end, they seemed like friends. Full of familiar light and color. I'm still waiting on my copy to arrive. From your review it sounds like it will be wotth the wait. I thought it was. The ending is particularly good. Great review, as usual, Angie! I love Robin McKinley's ability to make small details--like Sunshine's huge cinnamon rolls--feel wholly real, and delectably so. Exactly. You come out of this one drenched in honey. And isn't it just the loveliest cover! You're welcome, Charlotte. Love the cover. And all the bees throughout. You bet, Christine. We're always happy to spread the McKinley love here at the 'Ville. Thanks, Lenore. Hope you enjoy it!